I leave lots of honey on my hives in the winter. Usually about 70 pounds for established hives, a bit less for the smaller hives. In a normal year this will provide food for the bees from October, when forage disappears, to late February, when forage emerges. This year was a bit different. The weather turned odd. Why do I imagine everyone regardless of where the live in the world now nodding their heads? 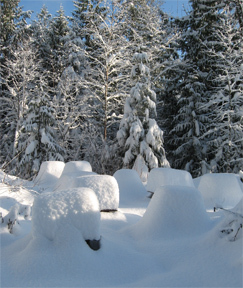 We normally have snow, lots of snow. This year we had sun. Not lots of sun, but quite a bit. And only one week of snow. This was worrying as bees were out and about, not in cluster. When I see bees out and about I figure they’re eating more honey for energy. So I checked the hives and found that most were fine with lots of honey but about 8 smaller hives and 2 larger hives had plowed though their stores. I needed to make bee candy. No matter what we make for the bees. Nothing is as good for them as their own honey. I do mean their honey. 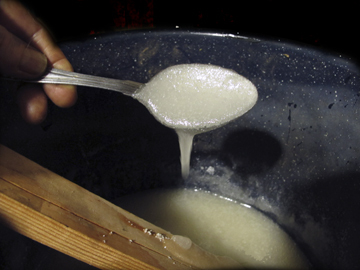 Anytime you give a hive honey from another hive you are risking the movement of diseases. I do move honey frames around between my hives. I never use any other beekeepers honey in my hives. That said, if you, or you bees, don’t have food – anything is better than starving. So we should make that “anything” the best thing we can. I use Cane Sugar. 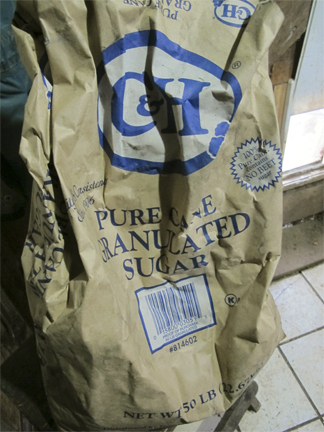 As of this time, Cane Sugar is not GMO (I think), but Beet Sugar is GMO. So my bees get cane sugar fondant. I had a recipe, but mine always comes out a bit gooey. During a recent meeting at the Skagit Valley Beekeepers Association one of the beekeepers, Brad Raspet from Bingaling Bees, passed around the most beautiful disks of bee candy (aka fondant) that I’d ever seen. Then he gave us the recipe. Brad explained what the vinegar is all about: it makes the sucrose in sugar take on a more glucose-like structure, making it easier for the bees to digest. My mother was a great woman (who could periodically drive me mad, but that’s what moms are for). Raised 2 kids alone, a brilliant mathematician, rose to be a VP in a prominent think tank. Could not make candy to save her soul. Divinity: flat, not fluffy. Pralines: they were supposed to be that runny, right? You get the picture. I have inherited this lack of ability, it would seem. Mine was not nice disks. Mine broke apart and was crumbly. I know it’s me and not the recipe; it’s a family thing. I use a deep pot. 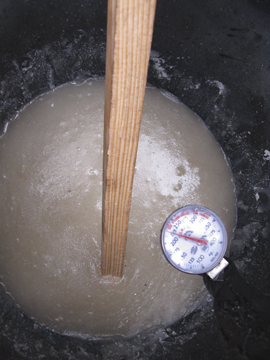 A long piece of wood is used to stir the fondant. A candy thermometer watches the temperature. Slowly, and I do mean slowly, because you have to keep stirring, the bee candy thickens. My bee cooking is down in a section of the barn. 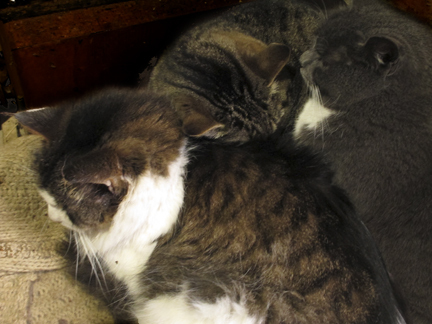 I have barn cats who really like this, as the heater is on during cooking. The actual process rather bores them, however. Really, Brad’s was completely smooth and didn’t crumble. 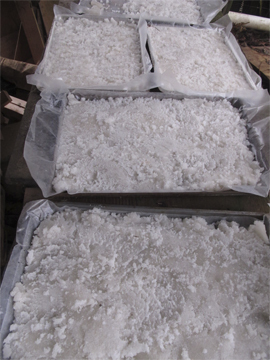 Then out to the bee yards to put the fondant on the top bars. My hives have a small “collar” – a 2 inch tall box – on top. If you look close you can see the top entrance at the top of the image. The candy is placed on the top bars, the burlap laid back down over the candy, and a piece of insulation above the burlap — then the top is put back on. One little bee came up to test my cooking. If the bees need the candy they will eat it. If they don’t need it, they will ignore it (it’s not as good as honey). But in the mean time, I’ll worry less. That’s the news from Brookfield Farm Bees and Honey, Maple Falls, Washington. 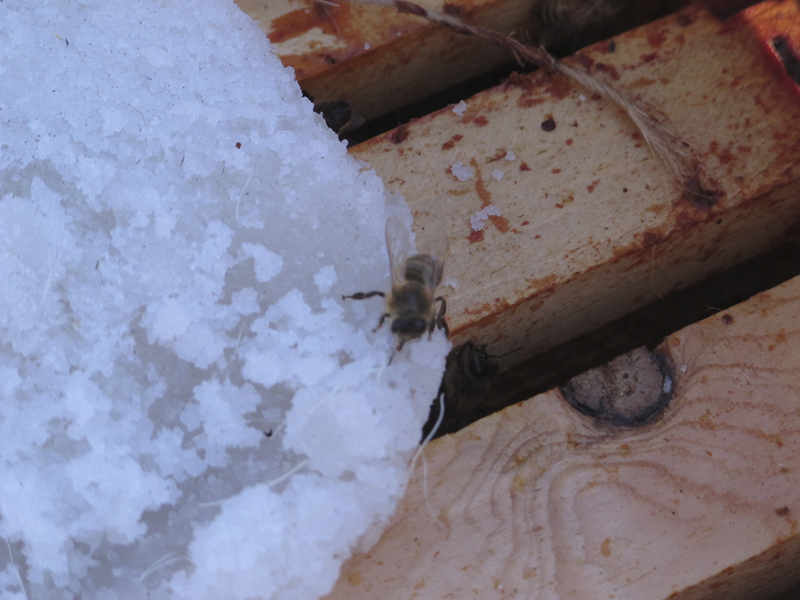 Has the world’s odd weather affected your bees or changing how you are managing your bees? Do share…. This entry was posted in 1 Beekeeping, 4 Feeding Bees and tagged bee candy, beekeeping, Brookfield Farm, feed, Fondant, honeybees, Maple Falls, Washington, Winter. Bookmark the permalink. 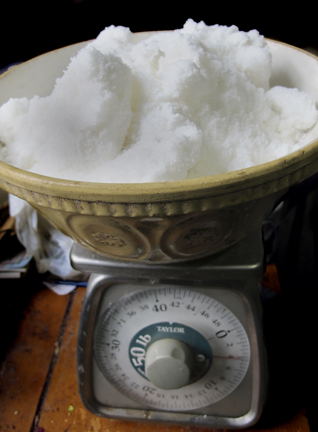 Karen, your recipe is perfect (btw 10 lb sugar is roughly 20 cups), and I think you will get that smoother texture if you let the hot sugar syrup cool down to under 200 degrees, and then beat it well with a mixer or in a stand mixer until it is silky and opaque. It turns white as you beat it. 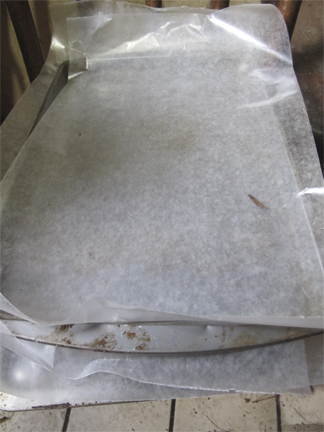 THEN pour it into the molds (I line mine with wax paper). Drying in a furnace room overnight helps too as if left out these bricks draw in water molecules from the air and turn gooey. Get em on the hives pronto for less mess. Why don’t you ship packaged Bees ? I live in Conn. and it’s a long way to pick up from your stores. Can you recommend another supplier that ships ??? Thank you for posting that Brad. Next time I make bee candy, I’ll pour sooner. Yours is the best recipe I’ve ever seen. I used the recipe and made the most beautiful fondant for my bees. I started beating it with a blender at 200 degrees. 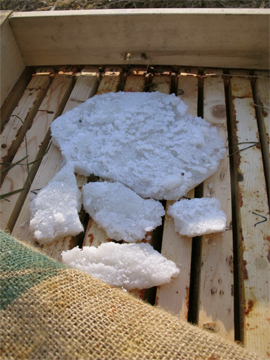 Frames with plastic wrap held in place with clothes pins were used as molds. I used a cup to ladle the sugar because the pot was too big to handle safely. The set fondant will go in the hive tomorrow. 10 lbs of fondant filled two frames. Thanks so much for sharing the recipe and pictures! Linda – I’m catching up on the web. I think I wrote, I hope I wrote back. But I’m glad the recipe worked for you – it’s Brads from BingALing Bees in Mt. Vernon — I figure if I, the worst candy maker in the world, since my mom passed away, can make fondant from his recipe, it has to be right on. Thanks for the recipe! This is my first year feeding my girls, and this is the recipe I’m choosing to try. I, too, am something of a kitchen klutz, but I will feel better making my own and knowing exactly what’s in it. Wish me luck. I am soooo late in responding to people, I do apologize. How did it come out? It’s really Brad’s recipe (BingALing Bees, Mt. Vernon, Washington) – I’ve got to get around to making mine – I usually pop it in on warm days in February, when I start to worry (well, worry more, I’m good at worrying in general). Hi, I’ve been using this recipe for a couple of years and always end up adding a few more cups of sugar to thicken the mixture once it has cooled a bit and don’t have a problem with it breaking apart. Thanks Pat – I’ll try that next time….you don’t think it’s a genetic inability to make candy, eh? We shall see.